Remote Control Transmitter and Receiver, 220 volt, handles up to a 2.5 maximum HP motor, 15A relay receiver. 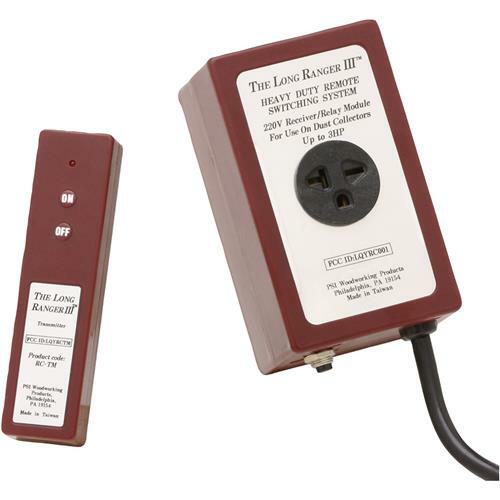 Turn on a dust collector from anywhere in the shop with the remote dust collector switch. Grounded with a reset button, this remote uses RF signal, which is not affected by outside interference by large TV's transformers, electrical noise, or 3 phase power sources. I teach woodworking to young people who have had a troubled past. For many years we would have to turn our dust collection on and with more than one instructor in the class it was a real problem with communication because of the noise. Now i simply clip the remote switch to the front of my overalls and can turn the system on and off from anywhere in shop. We have even started a new rule in the shop now, when the dust system goes off everyone stops what there doing. This allows me to talk to the students without a lot of hollowing. I feel that the remote switch not only increases our dust collection ability but also makes a much safer work place. I had concerns about how good the switch would work because of size of shop. Approximately 25 feet by 75 feet. But can report switch works great. even went out into hall just to see if it would work, and yes it does exultant. great product. I also have the 110 volt modal in my home shop. when I asked him for a battery and then went to his shop where I had all ready set it up and turned it on. These work great. Saves me the time and aggravation of going to the dust collector every time I want to use a saw or planer. I was looking for a different depth ruler but this one will work for what I want to do. I now have eight of the 220 volt remote controls and four of the 110 volt remote controls, never had a problem. All I've done is change batteries in the handhelds. The G0777 dust collector I also purchased has far exceeded my expectations. Using with SuperMax drum sanders, never had such a clean area before. Works as advertised. Should have purchased it years ago. Thank you for the prompt service. This item is working well and keeping my dust collector on when I need it most. Been using for several months and the remote saves me time and steps and the technology is flawless...any where in my shop, push the button and the dust collector starts and stops every time depending on the need. Love it! This remote has excellent range. I'm shooting through a seven inch thick wall to my vac and it works first time and every time. I can hang the transmitter on the wall or clip it to my belt. It will be used to turn the dust collector on and off remotely making it unnecessary to leave the machine I'm working on to do so. It is a great convenience and time saver. So far it is working very well and I would recommend it for any woodworker. Have purchased these remotes in th past and they usually work as advertised, this one seems to be the exception, it will only operate if you are standing less than twenty feet from the unit. The battery was dead when we received it but changing it made no difference. I would recommend this based on previous ones in use that have worked fine for several years in daily use.